This is a standard work in New Testament studies. Ferguson also comes from a Church of Christ background and has taught at ACU for many years. This is a must have book for any student of the New Testament with thorough articles on hundreds of relevant topics. This is one of the standard reference works on early Christianity and is a fantastic read on the cities of the ancient world and the impact of those various cultures on the spread of Christianity. The only thing I don’t like about the book is Meeks’ doesn’t believe all of the NT epistles of Paul were written by Paul. He believes some of them were written by disciples of Paul. That doesn’t take much away from the quality of the book is one of the most helpful books out there on this topic. This is a narrative account of New Testament history that is very helpful in explaining the chronology of Acts and Paul’s ministry and how that fits together with the books of the New Testament. This would be a good introduction to the New Testament. This is a classic work on the book of Acts that is a bit dated at this point but still an excellent book that deserves attention. This book is also a bit dated now along with Bruce. Barrett provides quite a bit of detail and background material that I have found helpful in my studies. Like Bruce, very worthwhile but also good to use alongside newer resources like Keener and Witherington. This is a must read for studying Acts. It isn’t a commentary but his work on Paul and Judaism is exceptional. This is a landmark book. This is a fantastic set of commentaries that covers everything you could imagine in the book of Acts. Keener has cited over 50,000 extra biblical resources in his extensive study. It is a bit pricey but you get what you pay for. In my last study on Acts I used Talbert along with Keener and Barret and found Talbert a nice complement to the others. He gives you the gist, helpful information along the way (small pieces of background, etc that help things come to life) along with the structure and flow of the book. 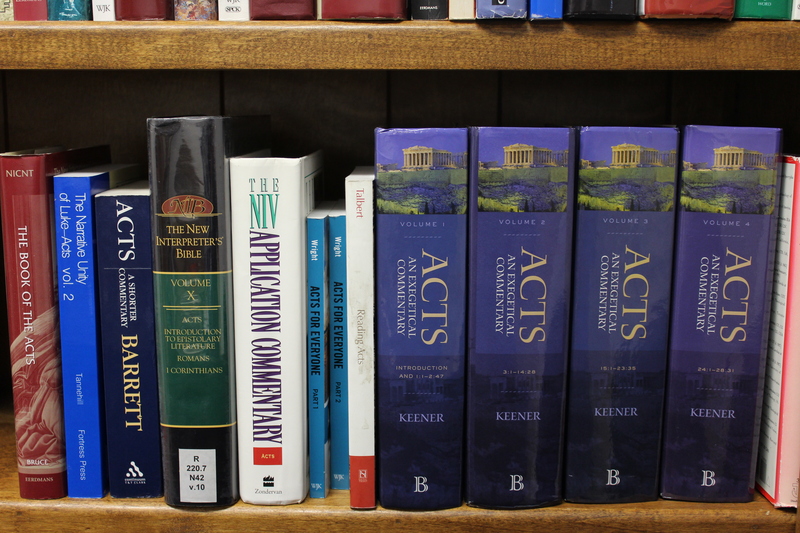 If you are looking for a single volume commentary on Acts, this is the first book you should go to followed by Bruce/Barrett. I have used this on a few occasions and found it helpful to get the gist of Acts. Wright is very readable and will give you the broader theological sweep of what is going on. I really like using Wright’s “For Everyone” along side Witherington’s “Socio-Rhetorical” commentaries.